Ready to find out how to save money at the grocery store? Saving money is something that we all could do better at. However, it isn’t always easy. One particular area that you have to spend out on a lot is groceries. The worst thing that you can do is to go shopping on an empty stomach. An empty stomach means that you are going to feel hungry and that you might buy snack foods that you wouldn’t usually buy and that are often expensive. One study suggests that you are more likely to spend more money at the grocery store when you shop on an empty stomach. And not just on food products but also on non-edible products too. Rather than having a shopping list being a reminder of what you need to buy, it should be a way to exclude all the things that you don’t need to buy. Write yourself a shopping list on a notepad before you go out and stick to it. That way you will be less likely to make rash purchases. I like the All Out Of Pad by Knock Knock. This notepad helps you create your shopping list on the fly. Then when it’s time to go to the stores you just rip the sheet off and you’re all set! While there are going to be times when you need something in an emergency or have forgotten something from the shop, this should never be a regular occurrence. Instead, you should try to shop on a weekly (or even monthly) basis rather than a daily basis as this will help you to plan your meals and cut down what you spend. One of the best ways to save money on groceries is to think about what you are cooking that week in advance. Planning meals not only cuts down the chance that you will do daily shopping but also means that you can make dinners in bulk or that you can repurpose leftovers for the next day’s dinner too. 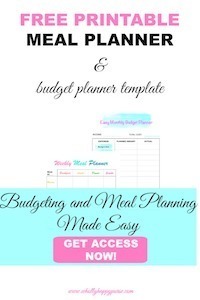 You might also want to try out the 5 dollar meal plan where you get a pre-made weekly meal plan and shopping list. Your meal planning is done for you. You save both money and time. It may not always be ideal if you are shopping with kids or in a bit of a rush. But if you have the time and focus, then it is a great idea to take a calculator when you head out to the shop. Having a calculator with you when you go to the stores will allow you to work out how much you have spent as you go round and stop you from being tempted to grab something extra. If you are a bit of a food snob, it can be less than tempting to buy an own brand version over a brand version. However, you really could be missing out on a great way to save yourself some money. Own brands are not only cheaper but for the most part, it is difficult to even tell the difference between them and the more expensive brands. We are all tempted by a bargain and if you can save money on something that you need or that you usually buy then this is great. That said, if you are tempted to buy something that you wouldn’t usually buy, then this isn’t going to be quite the bargain that you hope for. I hope that you enjoyed reading the How To Save Money At The Grocery Store post and that you’ve found it useful. As you can see, there are some ways that you can save money on your groceries. Why not try it out for yourself and see how much money you can save yourself?